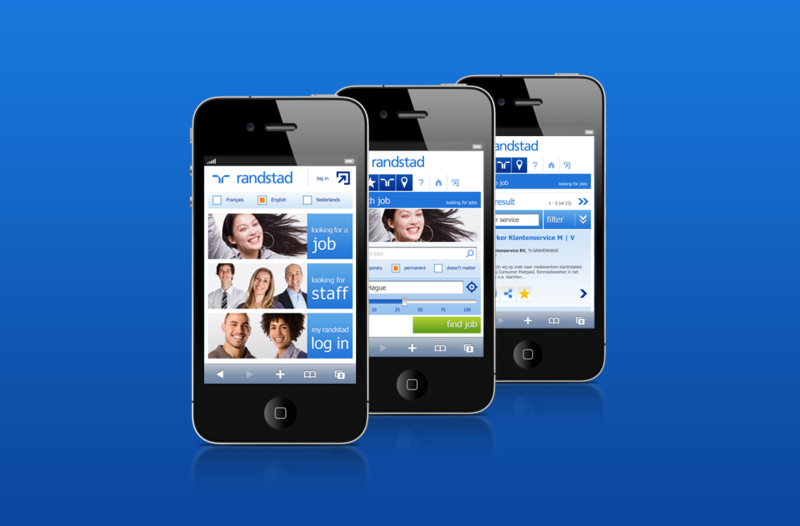 Randstad’s mobile style was developed by Sharewire. 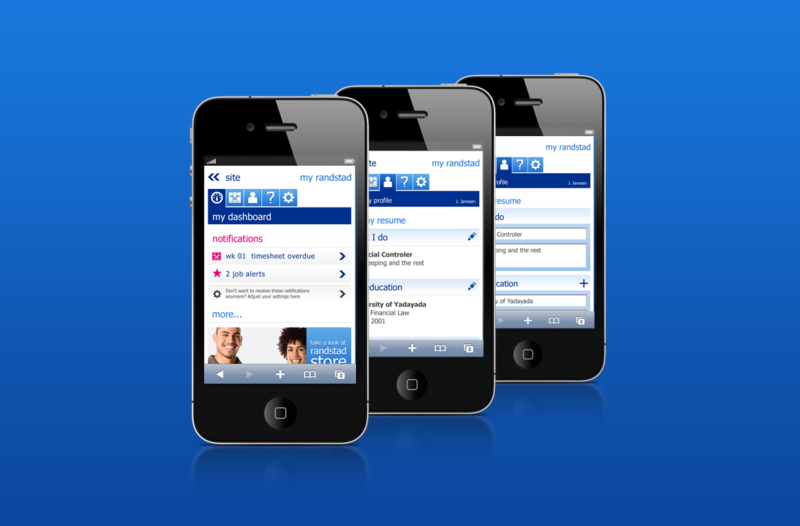 This mobile identity forms the guidelines for all the Randstad operating companies worldwide. Randstad is active in more than 70 countries. As a major brand it is important that each country has a consistent appearance. Randstad already does this with their websites which is identical in each country. Mobile is becoming increasingly important in the recruitment industry, which is why Randstad wanted such a concept for their mobile sites. The starting point was a concept and mobile house style, which is ready for the future. Additionally it had to be flexible enough to implement in all countries. Working with a core team from Randstad, Sharewire identified who their users are, what they want and how to achieve it. During several workshops the global identity of Randstand was created. Personas and user stories where used to create an outline for a mobile site. This mobile site offers functionality that meets the needs of the user. This concept fits perfectly with Randstad’s core values. The concept was subsequently transformed into an interaction design. This interaction design went through several rounds of usability testing. This provided confirmation that the mobile was quick and easy to use. The visual design screams Randstad. The colors and style elements of Randstad’s strong house style was applied to the mobile platform. The characteristics of a mobile platform were taken into account, and where necessary specific adaptations were made. The end product is a interaction and visual design that communicates a house style guide that each operational company can use to develop their mobile site. The operating company can choose from a quick-start or an extended version according to their needs. Finally Sharewire has written a manual for mobile marketing to go along side the development of the mobile site. Practical tips and points of attention that the marketeer needs to know. 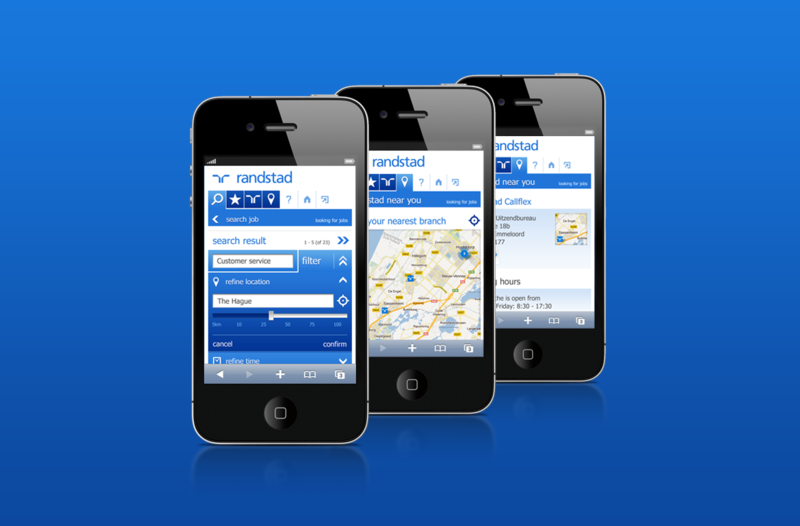 At present, the mobile sites of Randstad Germany and Portugal are live. Other countries will follow in 2013.